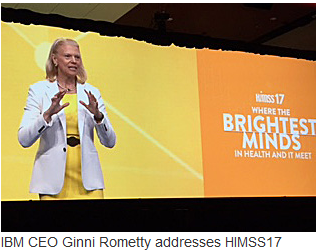 The foregoing excerpt from IBM CEO Ginni Rometty’s opening keynote address on the second day of the HIMSS2017 conference in Orlando, Florida, USA, as reported by Mark Hagland in the February 20 special edition of Healthcare Informatics (http://bit.ly/2lJ2XHH) makes clear the requirements for successful cognitive computing in healthcare, by which she means both medical practice and healthcare delivery. These five “lessons” that have been learned by IBM in the application of artificial intelligence (i.e. — its Watson natural language-base analytics solution) to healthcare are: 1) develop a range of cognitive services, 2) provide transparency regarding development of the included intelligence, 3) engage healthcare subject matter experts in development and use, 4) implement the solution in a hybrid cloud environment, and 5) include an ecosystem of healthcare professionals. The non-functional/platform-based and functional / intelligent business process management suite-based features and functions specified in the Cloud Healthcare Appliance Real-Time Solution as a Service (CHARTSaaS) reference architecture (RA) encompass all five of these lessons.